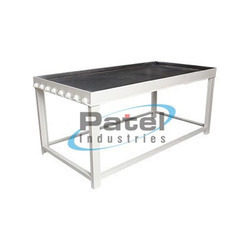 Prominent & Leading Exporter from Rajkot, we offer cooling plate. In our extensive assortment, we are manufacturing, exporting and supplying a qualitative array of Cooling Plate. Our well trained workforce only consumes perfectly tested unfinished material and the modernized technology during designing these cooling plates. Additionally, we are offering these cooling plates in numerous stipulations for our patrons at very nominal rates.